What syncs, and when does it occur? For most users, data syncs across as they would expect rather intuitively. However, there are some finer points that more advanced users might be interested in knowing, so below we've put together a comprehensive list of exactly where data syncs too and from. Data will sync whenever Ecanvasser or NationBuilder pull a trigger. Edit a Voter in NationBuilder - ? Voters will only sync from your Nation to Ecanvasser if they are imported via a List. Any individual Voters you create within Ecanvasser will sync across to your Nation, and be tagged with the name of your Ecanvasser Campaign. If you opt to also use Ecanvasser's Voter Import (from a spreadsheet) for any reason, you may wish to note that these bulk imported Voters will not sync across to your Nation. 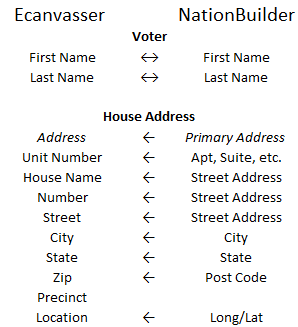 If you delete a voter from Ecanvasser, they will note be deleted from your Nation; and likewise, a Voter deleted in NationBuilder will not be removed from your Ecanvasser campaign. It is worth noting that for optimal data structure in Ecanvasser, addresses in your Nation should be structured so as that they take advantage of NationBuilders Apt/Suite field. If this information is held with general address information, it may result in Ecanvasser believing this is part of the Street Name. Ecanvasser's Reception Rating will sync back across to your Nation, to the corresponding field of Supporter Level. However, NationBuilder will not push Supporter Level information to Ecanvasser's Reception Rating. Note: These fields are managed in the inverse, i.e. a 5 Star Reception Rating will sync to your Nation as a Level 1 Supporter. 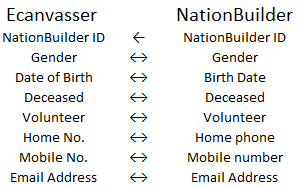 Currently, any other data points will not sync between Ecanvasser and NationBuilder. This is usually due to some technical complications regarding integrating both platforms, that said, we're always looking to deepen our integration with NationBuilder, and expect to do so regularly! In the meantime, if there is a particular piece of information your require syncing between two, the usual solution is simply to opt to use Custom Fields to host the information on both sides, as outlined above.